FLEXspace is a repository and open online education resource institutions can use to research and share information about successful learning space design. A true grass roots collaboration, access is free to .edu domain owners. Using ARTstor Shared Shelf, the community is growing a rich resource that, after only about five years since its inception, is already demonstrating its potential to improve both the process of creating campus learning spaces and the science of using them. Campus Technology spoke with two FLEXspace team leaders (who work remotely from their home institutions): Lisa Stephens, Senior Strategist, SUNY Academic Innovation, SUNY System Administration and the University of Buffalo; and Rebecca Frazee, FLEXspace Manager and Lecturer, Learning Design and Technology Program, San Diego State University. Mary Grush: FLEXspace today is a very active collaboration among many institutions and organizations. Where did it begin? Lisa Stephens: The genesis of the idea came out of the SUNY system about 5 years ago to leverage expertise throughout our very large, 64-campus system. One day our SUNY provost posed a question to his advisory group: "Isn't there a more efficient way we can share all of the information we have about how we build and renovate different instructional and learning spaces?" The SUNY Learning Environments Task Group was formed to investigate solutions. This was back in the days before widespread cloud adoption. We were batting around ideas like using Facebook or Flickr. Joe Moreau, now Vice Chancellor for Technology at the Foothill-DeAnza Community College District in California, chanced to speak with ARTstor's Director of Strategic Services, Megan Marler. Together they recognized that ARTstor already had a robust architecture with the ability to host extensive content collections. And importantly, ARTstor was looking to grow its offerings of open education content resources. What they then envisioned was truly a marriage made in heaven: ARTstor offered a service that individuals or organizations could use to curate their own collections; SUNY needed to create a resource that would provide a store of examples of its learning spaces. We immediately put together a pilot project and proof of concept for our work within the SUNY system. Grush: Then how did this initial effort evolve to become a resource for a wider education community? Stephens: We first shared our plans at the Consortium of College and University Media Centers (CCUMC) conference in 2012. The reception was much greater than we anticipated, as attendees pressed us for information on how their institutions could become involved. We knew at that point that we had a tiger by the tail. The CCUMC board stepped up to the plate right then and there, offering to help grow and foster wider collaboration based on the ideas we presented. In addition to support from CCUMC and SUNY, the Cal State system offered help. We had what we needed to begin building our collection on ARTstor, along with the realization that the broader education community would soon want to be involved as well. Grush: At that point, were the design issues becoming different from your original plan? Stephens: Yes. We had to spend a bit more than a year talking with colleagues all around the country, to begin to figure out the balance of how to collect just enough information to be useful, but not so much as to be a burden for potential content contributors or confusing for users. Then our core team was able to concentrate on how to get that content uploaded and sortable. Grush: What was the most important thing you did in your design, to make the tool very useful? Stephens: We created three different, robust taxonomies. 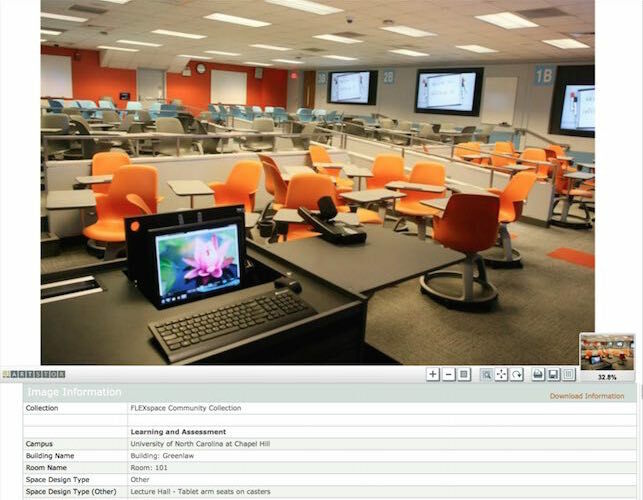 One would enable educators to search on content by the type of teaching that was taking place in the space (plus assessment measures surrounding that); another taxonomy was for the technology integration community (e.g., the type of equipment and furnishings that would support instruction); and a third taxonomy was for the facilities and architecture community (focusing on the technical requirements of how the room was constructed or renovated). The three taxonomies were designed for three separate and unique perspectives. People naturally will tend to see a problem through the lens of their own experience and expertise. We hope that by offering these three distinct taxonomies, we will provide a tool that promotes understanding and helps bring together people who are working from differing points of view. Grush: So, people with different roles and perspectives will be working together as their institutions build or renovate learning spaces. How would you characterize FLEXspace as a planning resource? Stephens: Currently, FLEXspace fulfills primarily a utilitarian planning need. As IT has become more commoditized, and funding has become tighter on all campuses, sometimes there's a disconnect between the people who use the technology and those who are responsible for planning and implementing it. Classroom technology planning and support falls into a grey area where it is critical for faculty, facilities, and IT people to work together, and FLEXspace is a tool that provides a place to foster those conversations along the lines of "What are our peers doing?" "How has campus X solved this challenge?" "How do we build an active learning classroom in building X that supports the innovative strategies the instructor has planned?" "What kinds of pedagogies are being used in the active learning spaces serving different types of disciplines?" Clearly as the FLEXspace collection grows, the resources to respond to these questions will only get better. Grush: Then how is FLEXspace connected to the academic mission of each university? Will FLEXspace help planners incorporate current pedagogy relative to larger education trends and strategies? Will it help teaching faculty make better use of instructional space in their learning designs? Stephens: Absolutely, these are goals. Higher education in general is currently living in very disruptive times. We're learning how to leverage data-driven analytics, MOOCs, and the modularization of education along with competency-based learning. Our students are demanding these things. The longer vision for FLEXspace is to serve as a strong academic resource that researchers can rely on to study issues like: "What's the best size class when using pedagogical style X in the Y type of environment?" or "What type of resident technologies are required to most effectively capture content for re-purposing in a MOOC, developmental education modules, or tutorial applications?" FLEXspace, particularly when coupled with the Learning Space Rating System, is envisioned to be not only an infrastructure or facilities planning tool, but ultimately a forum for learning space designers and builders, as well as faculty using these flexible learning spaces, to engage in global conversations about how space and environment impacts learning effectiveness. Grush: How does FLEXspace support pedagogical design right now? Rebecca Frazee: When we're designing campus learning spaces, the starting point — as we would hope — is pedagogy. Supporting active learning is clearly a priority today — and collaborative, active learning in flexible environments is certainly an important goal for us as we design learning spaces. So, that's why in FLEXspace we describe the types of active learning supported in a particular space. We go from there to determine what kinds of instructional technologies can be used to support particular learning activities, along with what kind of flexible furniture, room arrangements, and other elements also support those learning activities. Another important consideration is facilities. We don't always have the luxury of building from scratch. You might have an existing facility with a certain amount of square footage; you might have existing administrative requirements such as capacity expectations. So, particularly with existing facilities you have both physical constraints and policy requirements that must be considered. We think it's important to present all of those elements in FLEXspace so that users can see examples of how other universities have tackled these kinds of requirement challenges. Grush: Is there a way for users to discover the relative levels of success of the examples they'll find in FLEXspace — and maybe apply that information to the designs they are working on for their institutions? Frazee: Yes, increasingly, FLEXspace is being coupled with the Learning Space Rating System tool developed by EDUCAUSE. The LSRS is a means by which to score the potential of a space. It's a highly quantitative measure based on the learning services and artifacts that are present in a space. We are seeing campuses build out master learning space plans by first using the LSRS to rate their existing spaces as a means of prioritizing what they need to address first. Then they use the appropriate search terms on FLEXspace to identify examples of what they have found to be priorities. Grush: How can users organize the information they find on FLEXspace? Frazee: One very handy feature is that you can select your favorites, and with one click export those examples into a PowerPoint that can be shared with others and used to foster discussion within the institution — and to present to senior leadership to gain buy-in — long before anyone needs to sit down with architects, or contractors, or consultants, or donors. Grush: Who can access and contribute to FLEXspace? We also have public-facing website, FLEXspace.org, with selected information, including what we call Spaces in the Spotlight — so even people who are interested but don't have an .edu domain have access to some great information. You don't have to have an account to come to the FLEXspace.org site [FLEXspace.org]. Grush: It looks like, besides entering controlled or free search terms, users can scan through thumbnails which take them to high-res images… is FLEXspace designed to be a very visual tool? Frazee: Yes, but there's a range of types of images and other information — from the pictures people casually take of their spaces, to professionally done layouts. There's other graphical information, too, such as line drawings, floor plans, videos, and even paint color samples on occasion. People might also upload research publications or Excel spreadsheets with equipment model, vendor, and part listings. One of the beauties of ARTstor is that it allows high-resolution/high-definition images. So in most cases I can zoom way in and examine even the smallest of details in many of the images. Another very important point is that each record includes full contact information so that people at different institutions can contact each other directly to consult or share further information as they wish. Grush: How are the contributors responding to the platform and user interface? Frazee: Good question! I think it's fair to say that ARTstor's Shared Shelf was designed from the perspective of content specialists from the library community to serve a wide variety of collections from their portal. They understand that the FLEXspace users would like to see the search tools streamlined and have both the content upload and search features available on a fully mobile platform. They have been very generous with their development resources, and we've also been talking with them about how to bring the parallel development paths of the LSRS and FLEXspace solutions closer together. Like all start up efforts, we're learning a lot along the way! Grush: I know that FLEXspace is growing, both in the size of your community and in the features of the tool. What are some of your goals for the future? Frazee: As I see it, there are two main avenues with FLEXspace: One is to look at examples of what others have done — a virtual field trip of sorts; the other is to share and showcase what you have done. In either case, we see lots of opportunities for growth, while maintaining our community focus as a top priority. Of course, we are constantly developing our user support materials, especially to help institutions get their information uploaded. We are also working with our vendor sponsors to make truly valuable information about their collections and use cases available under the heading of "sponsored content". Ultimately, there are several areas in which we may grow: We will foster an open education resource that contains links to journal articles (and maybe at some point we'll publish our own journal); we will ensure that we have communities of practice that actively exchange ideas and research (perhaps beginning with threaded discussions); we will create a peer review system; we will continue to develop useful webinars and other helpful content resources… and there's much more in the works. In a way, "the sky's the limit". But the short-term goal is to maintain our existing vision, a useful planning tool that saves time, money, and effort for our community. Our name, FLEXspace, may evoke visions of flexible learning spaces, but really, the name was originally chosen to point to the exchange of information so that institutions can learn from one another and create the best possible learning spaces. Grush: FLEXspace is an extraordinary effort by the higher education community. It's taken off at the grass roots level and has quickly become a valued community resource. What has it been like to work on such a large collaboration with so many moving parts, if you will? Stephens: It has been truly a career highlight to work first with colleagues within SUNY, then across the country, and now increasingly around the globe. Rebecca and I have the very good fortune to serve as conductors to a very large learning space orchestra, and our fondest hope is that everyone using the system understands that it's still largely a volunteer effort that is growing into a more robust community service. Like all community efforts, we need everyone's help to make it better.